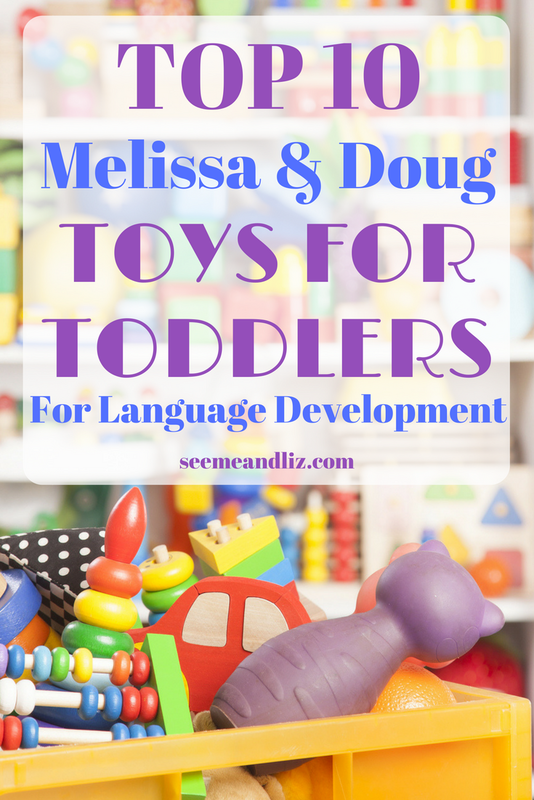 Melissa & Doug toys for toddlers are some of the best out there when it comes to language development and learning. I personally used these toys with my own children when they were young. Melissa and Doug toys were also guaranteed to be in my Speech Pathologist toolbox back when I was still practicing. These toys are well thought out with the goal of learning through play being at the forefront! If you are looking for affordable, well made educational toys for toddlers then you have come to the right place. These toys are not listed in any particular order. Be sure to find out how each toy can be used to strengthen your toddler’s vocabulary, language development and learning! I love this barn because children can learn so many new skills all while playing. At first, it may be difficult for a toddler to successfully and independently open the doors of the barn. But as his fine motor skills strengthen through practice, opening the doors will become a breeze! If you would like even more ideas for using a farm playset to build language click here. Unfortunately the reviews for this toy are somewhat mixed. But I have seen it and used it and disagree with most of them. Most complaints have to do with this game being “boring”. If you want a toy with flashy lights and sounds then of course this one might not seem very entertaining. But the toy itself is not meant to entertain. The only negative reviews I would agree with is that the spinner isn’t the greatest. Honestly, I never used it. Have you ever tried to get a toddler to spin a spinner, even one that works? It’s not that easy. What I did instead was write the numbers 1-5 on cardstock and cut them out. Then I placed them in a bag and let the child pick a number. Then she was asked to “catch” the fish with the matching number (there are 2 of each). ♦ Fine motor skills – this is worked on naturally when your child is trying to wind the string. ♦ Counting – there are 10 fish in total but they are labeled 1-5. ♦ Color recognition – ask your child to catch the “red” fish and you can catch the “blue” fish, for example. My kids loved these blocks. One word of caution before I get into any more detail, they do take up room. I thought they might be easy to disassemble, but you won’t want to do that on a regular basis. The set comes with 40 blocks in 3 different sizes. These blocks are really sturdy. My kids built a balance beam and I was able to stand on it! Kids love how big these are and that makes knocking a tower over so much more fun! ♦ Combining words – big block, little block, red block, etc. Regular blocks such as the Melissa and Doug Wooden Building Block Set are a good option if space is limited. To find out all of the learning opportunities that arise with a block set click here. Vehicle playsets are a wonderful toy for learning through play. This service station/parking garage is nice and compact making it perfect for toddlers. ♦ Pretend play – the cars were driving through the mud and now they are dirty and need a car wash, someone has to go to the grocery store and park the car in the parkade, etc. I know as adults, most of us hate chores. But toddlers love to “help” around the house. This cleaning set is sure to be a hit with the 2-3 year olds. In fact, I’m pretty sure a 4 or 5 year old would still have fun with this toy! It looks just like the real thing, but made for little hands and bodies. This set is great for pretend play, hand eye coordination, vocabulary and so much more! Everything in this set functions like the real thing, except for the mop. Don’t get that wet. This set is a must have for all kids. It’s perfect for toddlers but preschoolers and even young school aged children will still love this set. It goes perfectly with a kids pretend play kitchen but also works well on its own if you don’t have one. ♦ Categorization – this activity would be more suited for a child 3+. Start by sorting 2 groups, for example fruits/vegetables vs meat. Or sort by color! Melissa and Doug have several food cutting sets and they are all great! This particular set comes with a child safe wooden “knife”, an apple, pepper, cucumber, tomato, sandwich bread, carrot, slice of watermelon and a loaf of bread. The food items are held together with velcro and children can “cut” them apart. I loved these sets for my own kids and in my speech therapy sessions! Kids can practice everything from fine motor skills to sentence building and sequencing so they are perfect for kids ages 2+. These puzzles were always in my speech therapist toolbox and in my kids’ toy box. I love these puzzles so much that I featured them in 2 other articles I wrote. That’s why I won’t go into details here as to why these puzzles are so wonderful for learning. Melissa and Doug has many others as well. You can take a look at them here. What 2 year old doesn’t love bowling? These monster bowling pins are soft and cuddly and perfect for learning through play. Have fun naming each monster with your child while describing what makes them cute and funny (and definitely not scary). ♦ Vocabulary – include the words “my turn, your turn, knock down, pick up, ball, roll and try again” while playing. ♦ Describe the monsters with words like: green, blue, yellow, smooth, bumpy, pointy, soft, stripes,etc. A play kitchen is my #1 recommended toy for speech and language development and general learning through play. That is why I have included this one on my Top 10 list of Melissa and Doug toys for toddlers that promote language development. Here are 10 reasons why a kids kitchen is and always will be my go to toy when I am asked about the best toys for children. The Melissa and Doug Kitchen is recommended for children ages 3-5, however it is small and can easily be used by children 18 months and older. It will take a bit of time to set up as well as it does not come assembled. This selection of Melissa & Doug toys for toddlers won’t require any batteries. There are no flashing lights and annoying sounds and songs. Simple toys like these allow for more imagination, talking and learning than their electronic counterparts. Don’t believe me, read this! 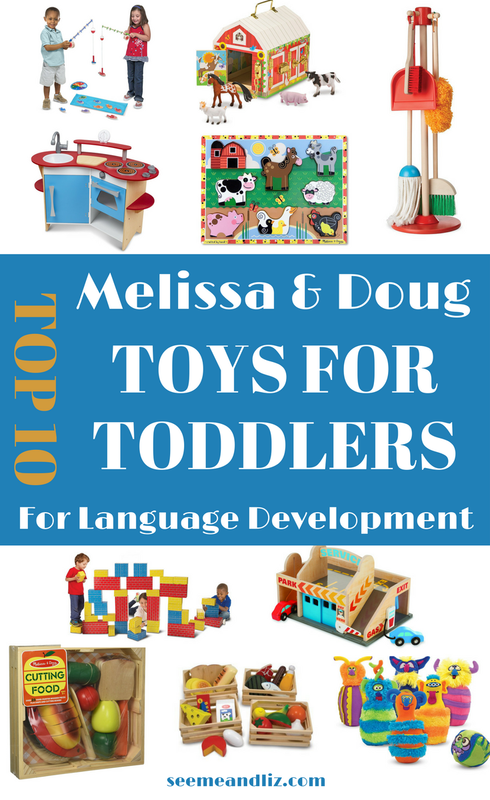 Melissa & Doug toys for toddlers are some of the best out there when it comes to language development and learning. Here are the Top 10 to help with your child's language development! 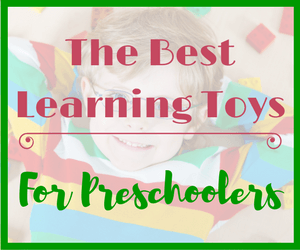 Click to learn how to best use each toy for optimal learning outcomes. What a bright and happy site with some wonderful toys to help develop our youngsters. I am a grandma and a great ma so I am always looking for good ideas for the grand kids. You have found some beauties here. My favorite was the gorgeous characters in the 6 pin bowling game. I also really liked your idea for a spinner in the fishing game. That same idea could be used for many different games where a spinner is required. It is refreshing to see toys that do not rely on batteries or computer gizmos to be enjoyed. 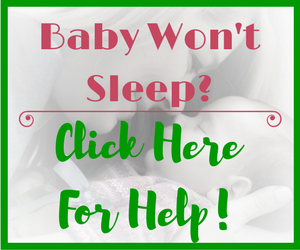 A lovely site and one I will come back to when I next need a gift for a young grand child. Thank you for your appraisal of each of the items, it is very helpful in choosing which one to purchase. Kids love the monster bowling game. It makes monsters seem like a fun and cuddly bunch! I have used my “numbers in a bag” idea often for games that require spinners, as most young children cannot figure out how to successfully spin a spinner. On my site you will never, or very rarely find a toy that requires batteries for optimal functioning! 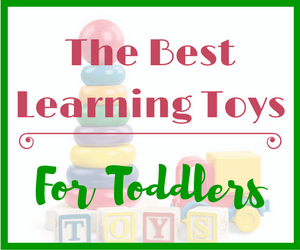 This is a very comprehensive list of toys to choose from for the purpose of language development and learning. I find it interesting because I used to work as a literacy teacher, but also because my son is currently training to be an ECE (Early Childhood Educator). I’m definitely going to pass this on to him to view. I’m sure there are things here that would interest him. Also, I liked how you improvised with the spinner by using numbers on paper instead. Cool idea. I appreciate you sharing the article with your son. Hopefully he will find it valuable! Children learn best through play! This goes for language development as well. But when it comes to toys the simpler they are the better. It is best to avoid the flashy (and annoying) toys that require batteries and claim to teach a toddler letters, numbers, colors, etc. I just came across your article and loved it! My son loves Melissa and Doug toys. But I had no idea how educational and helpful for language development they could be. This is great! Again, thanks for these wonderful ideas. 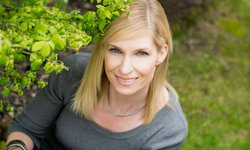 I will totally be visiting your site more often to get more ideas and information. I’m glad you enjoyed the article! Melissa and Doug toys are wonderful because of their simplicity. They are the perfect toys for pretend play and of course language development. 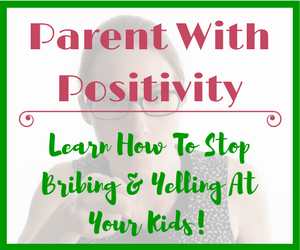 Many of the the tips I shared in this article can be applied to toys by other toy companies as well. These are very nice toys for toddlers. I really like how you showed how helpful they can be for toddler development. I love the large Cardboard Building Blocks because kids learn so many new skills while playing. Yes, they really are! 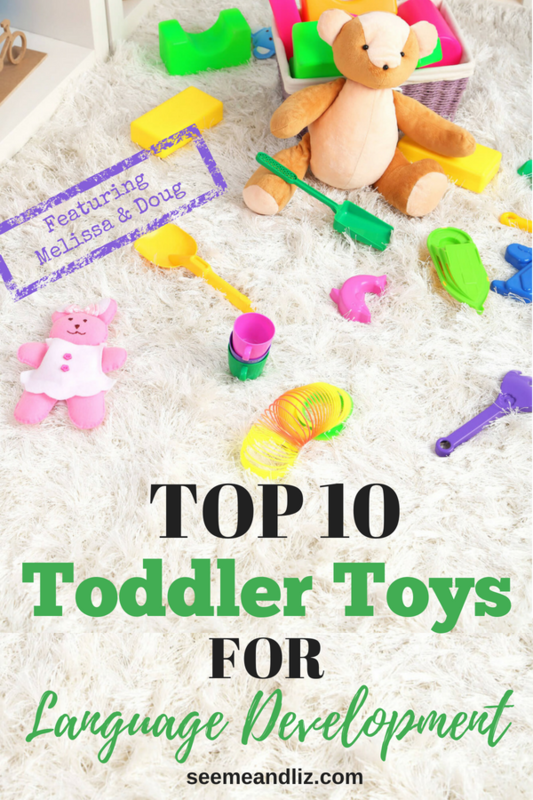 Melissa and Doug have great toys for babies, toddlers, preschoolers and even school aged children! The cardboard building blocks are a favorite of mine assuming you have the space to store them. My kids had hours of fun with them! My children always want to help me clean! The 6 piece cleaning set is so cool and cute. I think they would love it so much. They can also learn from it, that is a double plus. The wooden animal puzzles look great too. I know they will have tons of fun learning animal names. Thank you very much for these great toy ideas. I will be adding these to the toy room. Children really love helping around the house when they are too young to understand “chores”. So a play cleaning set makes a great learning toy for toddlers. Puzzles are also important. I actually wrote an entire article about the many ways preschool puzzles can be used for natural learning opportunities. Click here to read that article. I always love to read your articles. You have so many awesome ideas! I personally don’t have much experience with the toys you mentioned but a while ago we were at our friends and they had the broom and mop set and my oldest son loved it! A little too much maybe because he spilled a glass of water just so he could mop it up! And I can imagine he would love the kitchen stuff. He’s not much of a farmer, more into wild animals and then he loves to help me in the kitchen! It’s funny how kids love “cleaning” and “helping” around the house when they are little. It’s such a wonderful way for them to learn new skills and vocabulary in a natural way. Anything related to a pretend play kitchen is always on my recommended list of must have toys for toddlers, preschoolers and even school aged children! I’m sure your son would love to receive any of these toys for his birthday. This is amazing! 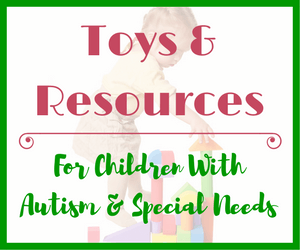 I go to our ParentLink Centre regularly and borrow toys from their toy library (the largest in Northern Alberta). They have quite a selection of Melissa & Doug toys, and I don’t remember seeing any of these! By the way, one that E (just turned three years old) likes is a damaged car puzzle with a tow truck that picks up the cars with a magnet. That is great to hear! I know the puzzle you are talking about. I actually almost included it on my list but was trying really hard to keep the number to 10. 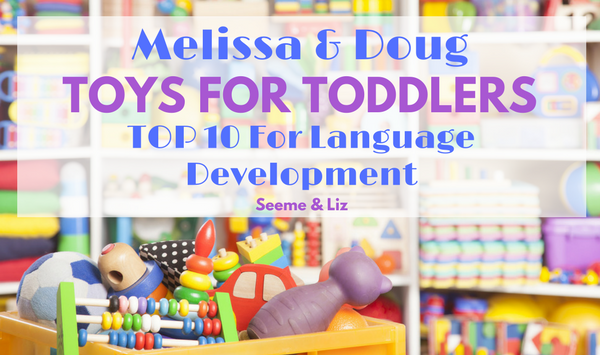 In reality there are many other Melissa and Doug toys for toddlers that are excellent for language development and learning through play.